The Patent Pending QuickCarb™ from Blichmann Engineering is a revolutionary simple new way to carbonate a 5 gallon keg of beer in less than an hour! 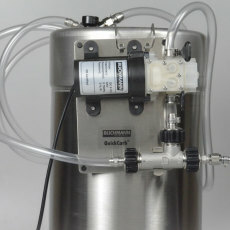 This patent pending product uses a simple circulating pump and a unique stainless steel diffusion stone to carbonate your beer precisely and quickly. And with no chance of accidentally over-carbonating your beer! 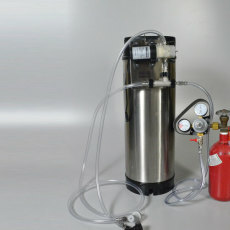 All you need to provide is the beer, ball lock corny keg, CO2 tank and regulator! 90% carbonated and ready to drink in less than an hour with no risk of over-carbonation! Let it sit for a day for dialing in that final few percent. 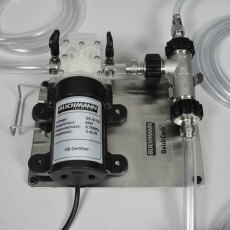 Interested in trying out inline oxygenation? 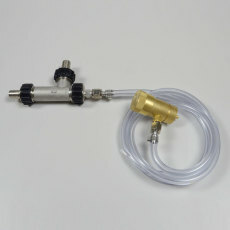 Simply add an optional oxygen regulator (Item GF081DR or GF081R) and you'll be able to use the QuickCarb™ components to oxygenate your wort before pitching your yeast! The assembly of the QuickCarb was easy. You only need to follow the instructions that came with the product once and from there on it is easy. The first time I used the QuickCarb, it started to work perfectly but after about ten (10) minutes, I was not able to see any bubbles from the CO2. Needless to say, even though it tells you to add about 1.5 to 2 psi more than needed to carbonate your beer, I found that it did take about 4-5 psi more of CO2. You need to see the bubbles of the CO2 in your tubing to know that the process is working. Once you have the psi set properly for your beer, all you need to do is check it every so often to make sure the CO2 bubles are still flowing. After about 40 minutes, the beer was carbonated and ready to drink. 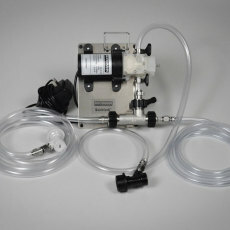 GREAT PRODUCT and now I can drink my beer the same day I keg it. While this thing is meant for carbonation, and it does this very well. I use it for anything that need a pump. It's self priming so it pumps gas. I use it for dry hop recirculating, draft line cleaning, transferring, you name it. It's an awesome product and very easy to clean. My fiance and I operate a small meadery and one of our products is a carbonated session mead. 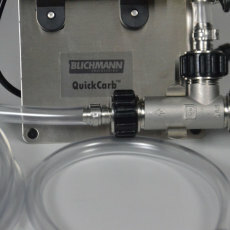 Within 48 hours of purchasing the quickcarb, we had already used it to carbonate 5 pin lock kegs. We followed the directions and crossed our fingers. The day after using it, we bottled 10 cases. There was no overcarbonation, in fact it was perfect and more consistent than our current setup which allows us to force carbonate 5 kegs at a time. You get a sense when it's done carbonating because the line leaving the quick carb back to the keg changes appearance from clearly carbonated to more clear. We both highly recommend this product! I have now also used it for two batches of homebrew which require different carbonation levels and I was easily able to get the carbonation just right with both batches. And it really only takes 45 minutes per 20L (5gal). I really can't recommend this enough, especially if you hate waiting the week or two for beer to carbonate.